3 miles on the schedule today. Because it was so nice out, I decided to do 5 miles today. Over the last couple years, given my never ending IT Band problem, I have become somewhat of an expert on foam rolling and the foam rollers. Not that I have daily problems with my IT Band, but I do use the foam roller regularly to keep from having any pain major issues. These are the three that I have used over the last couple years. I used this one initially for the first couple months and learned how to roll with it. They are inexpensive(I think I paid $20 with a video how to use it) and you can get it at your local running store or online and it worked great until.....it started to break down. Once that happened, it was not effective any longer. The biggest advantage to this is that it's cheap; however, the biggest disadvantage is that it breaks down too quickly. When you consider it broke down within a couple months(if you are a regular user of it like me), then the cost is really higher than you think if you have to keep replacing them. 2) TP Therapy "The Grid"
I used this primarily since I purchased it over a year ago. 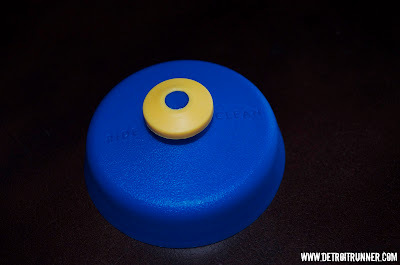 The foam does not break down and while it's more expensive(runs about $40), you really can't go wrong with this. It does take some getting used to since the foam is harder but once you are used to this, it feels great. Initially, you will not be able to put your full weight on it but eventually you will. I have used mine daily regardless if I run or not and I actually roll before I run AND after I run plus an additional time at night. The two weeks following a marathon, I also do an extra rolling session right when I get home from work as well. You could say I use it a lot! It's in my routine. The plastic inside the roller did break about a year into use but I contacted the company and they sent me a new one even though they did not have to replace it. It made me a customer for life! 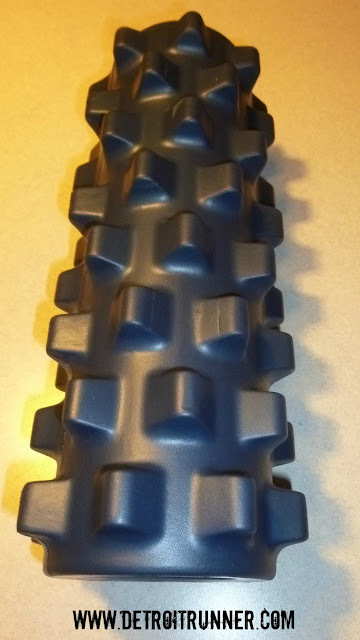 The third roller I have, I received in February of this year for doing a review of the product. While I don't use it daily, I do use it regularly. As you can see, this thing is a beast. See my complete review of it HERE. This roller has larger knobs that stick out on the roller. It also has foam that is harder and will not break down. This is for the serious roller. It really takes some getting used to. They even have a harder version and I can't imagine because this digs into the muscle pretty good as it is. I can now put all my weight on this but it probably took me a couple months of getting used to it before I could do that. 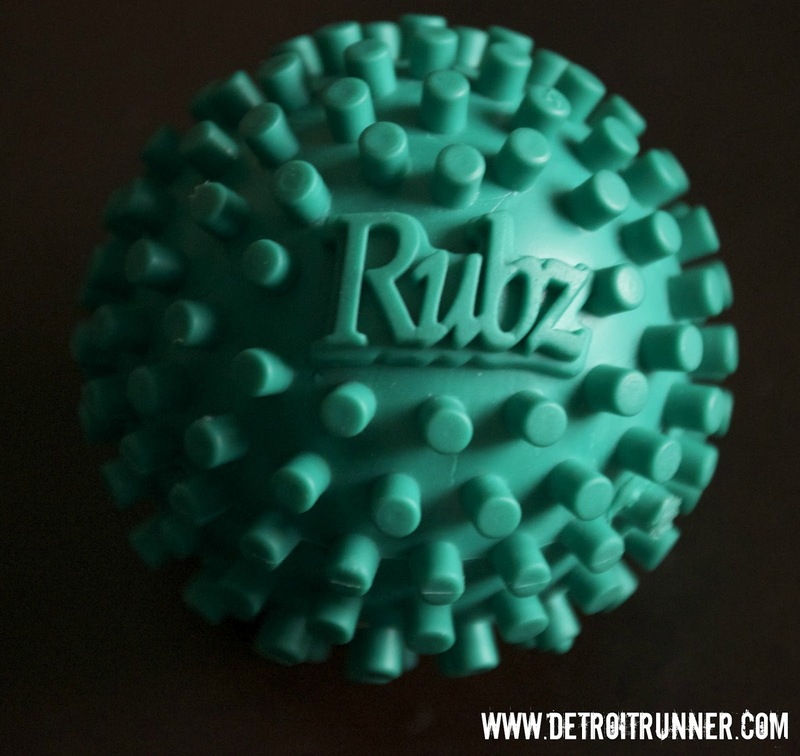 In addition, I don't have to do as many reps as on "The Grid" I especially use this after marathons as it really massages the muscle and while it hurts, it's not painful and get the knots out. I also own "The Stick". (about $28) I'm sure many of you have seen these. You basically roll the stick on your legs where you need to ease the muscle. It works great but I'm not a regular user of it but occasionally there are times when you cannot get the hurt out on a roller and this helps those particular spots. In addition to these, I've been rolling my foot with a new product I purchased at the Flying Pig marathon expo several weeks ago. It's called the Rubz. This little ball is great to use when you are just sitting at your desk typing up your blog posts. I use mine daily and it's done well for my feet. The great part is that it was only $6 so it's worth trying out for such an inexpensive item. I'm glad I purchased it. All of these items are travel size and I have traveled with them on vacation or when I go to races out of town. You can also get the Grid, RumbleRoller and the Stick in larger sizes as well. So there you have it. Massage options that I know have worked well for me. If you are thinking of getting a foam roller(or looking for a better one) and think you will use it, I would suggest you go with option #2 and/or #3. They have worked out very well for me. In my case, I actually use them in combination and, while they take time to use before and after, they will always be a part of my running routine. They help keep my legs healthy. 5 miles on the schedule today.....done! Temps were much better today than yesterday. It's crazy that it was 95 on Monday and will only be in the 60's on Friday. That is Michigan for you. This was one of those runs that I was sitting in bed debating about getting up but after I was finished was really glad I got up. My foot also felt much better today so hopefully that's a good sign. Speaking of Michigan. I just finished reading the book, "I Run, Therefore I Am - Nuts!" written by local author Bob Schwartz of Huntington Woods. Bob is an accomplished author that has been published in numerous sports magazines throughout the world. Most of you already know, if there is a book about running, I try to read it. Bob was gracious enough to offer a copy of his book for my review. While I do feel that I'm much better at running gear reviews than I am on book reviews, I'm always open to reading running books. This book is all about runners and the little idiosyncrasies that we all have as runners. Of course, it's a book with humor but much of what's in the book is not only humorous but frankly true of us runners. Also, since Bob has been a runner for over 25 years, he also can relate to the way it used to be in running compared to how it is today. It's a much more popular sport now. The book is broken out into 10 parts including topics such as "Rules to Run By" all the way through the Marathon, nutrition and motivation. This not a book for non-runners in my opinion. Non-runners would just not get the book or the humor to it. One thing I really liked about the book is the many topics covered and the many short paragraphs. In my mind, this is a good thing. It gives you a book that you can pick up and put down and easily be able to stop at the end of a chapter since they are short. Also, with the wide range of topics, it does not feel like you have to read it cover to cover in one sitting so it gives you something to look forward to on a daily basis. I read the book fairly quick(a couple weeks) and enjoyed the humor to it. I mean - if we can't laugh at ourselves, what's the fun in it? If you are looking for a fun loving humorous viewpoint of runners, you will get a kick out of "I Run, Therefore I Am - NUTS!" Pick it up at your local bookstore or Amazon.com now! 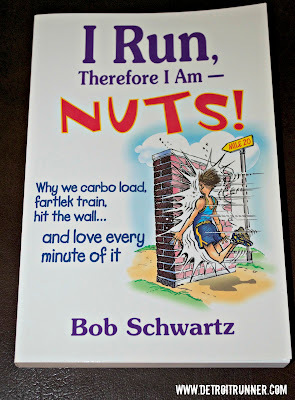 Bob also has a second book coming out in October called "I Run, Therefore I am Still Nuts!" and I can't wait to read this one and review it. 3 miles on the schedule today.....done! So I hope everyone had a good holiday weekend. Mine was enjoyable. I ran 4 miles on Friday in Northern Michigan at the cottage, took a rest day on Saturday with lots of walking in Bellaire and Charlevoix and ran 10 miles on Sunday with a rest day on Monday. 2 for four -- not bad. I think I like this non training plan running. I even had a beer at Short's Brewing Company this weekend and it's been forever since I've had one. It was oh so good! Had to get a beer in while I was not marathon training. While I'm trying to keep my long run above 10 miles, the top of my foot has been giving me issues. When I say issues, I mean it hurts! Actually, I'm good for about five miles but then after that I've got pain. This has been happening since the marathon. I think I tied my shoe too tight and pinched a vain so now I can feel it when I'm running long. I'm hoping it will go away but it seems to re-appear once I get over five miles. I probably should have stopped at the marathon to loosen my shoe - idiot! Yes, I know - RICE, you don't have to tell me. I'm icing as I type this. Just hoping it's not the start of stress fracture. The way I'm stretching, I don't think there could be a break in it plus I doubt I could even get one mile in if it were broke. 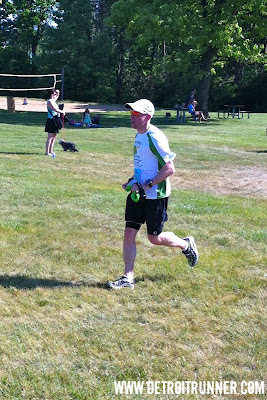 My long run of 10 miles Sunday was a hot and tough one. First, I planned to run it up north but it ended up raining outside most of the day. I probably would have run if it hadn't been thunderstorms too. A look outside the cabin - RAIN with THUNDERSTORMS! We planned to go home after dinner to avoid traffic on Monday, so after a three hour drive home, I did my long run at 9:30pm on Sunday night. Probably one of the toughest runs not only because I was already tired from the day and drive but it was in the 70's as well which didn't make it any easier. Not to mention my foot issue. I'm happy that I got it completed though as I was considering skipping my long run and frankly probably should have which I have not missed in over 2 years. Rest, relaxation and running. That pretty much sums up the weekend. Lots of R&R on the schedule for this weekend. Talk to you Tuesday! 5 miles on the schedule today....done. Felt pretty good overall too! 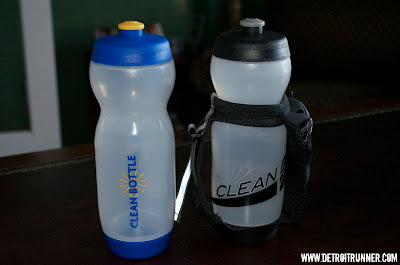 A few weeks ago I was sent the clean bottle. 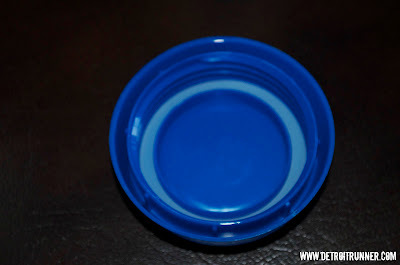 I contacted the company asking about a review of this bottle. 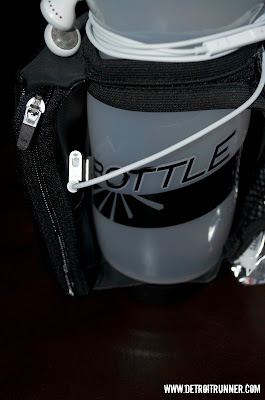 Since I've been running, I have been using a water bottle to run with not only with training runs of all distances but also all races. It helps me shave off a little time at races so I don't have to stop as much. These bottles are also great on the bike as well but I use them solely for running. An original Clean Bottle and The Runner Clean Bottle. The Runner is used for.....running! Ha. Of course, that's why it's called the runner. It has a space for your phone/keys/money/etc. It also comes with room to hold two GU in a very unique way which I'll show you in pictures. I can tell you I was really skeptical about having a bottom that opened, trust me that this really works. It has not leaked once and I have run both short and long with this. You can see right through it! The opening is quite large so it's very easy to get your favorite beverage in the container. As you can see above, with the top and bottom off, you can clean it easily. My biggest concern with this product is worry about it leaking. It doesn't - it's that simple. The design on this is made well. 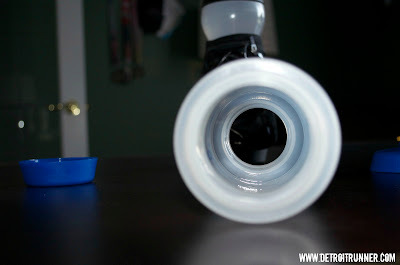 Also, on other bottles I have tried, the top sometimes leaks especially if it's turned upside down. 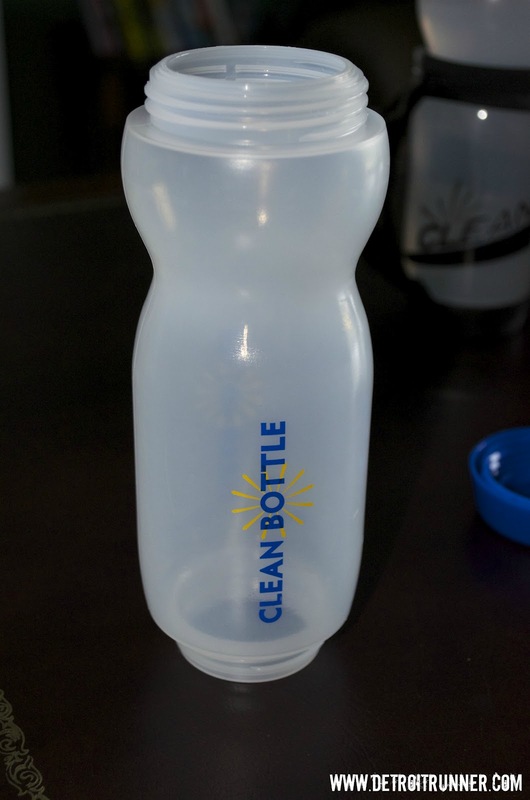 I turned the Clean Bottle every which way. I shook it like crazy and it still didn't leak. Score one for the Clean Bottle. Place to store your phone. This can fit an iphone. It fit my blackberry just fine as you can see it in the picture below. It will fit phones up to 2.5 by 5 inches. There also a little sleeve inside where the phone goes to allow for a credit card or some money. Another nice feature is the flat bottom. 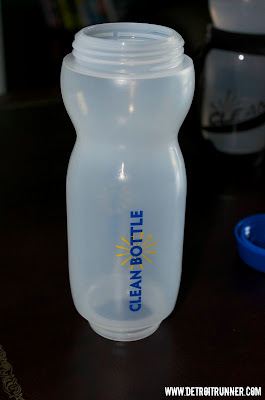 Other bottles I've owned had a wrap around bottom for the holder but this does not need that since it's built between the bottom of the bottle and the body. A great feature because you don't have to worry about the bottle tipping over on you. It has a reflective strap. This is always a nice feature especially for people that run in the dark like me. 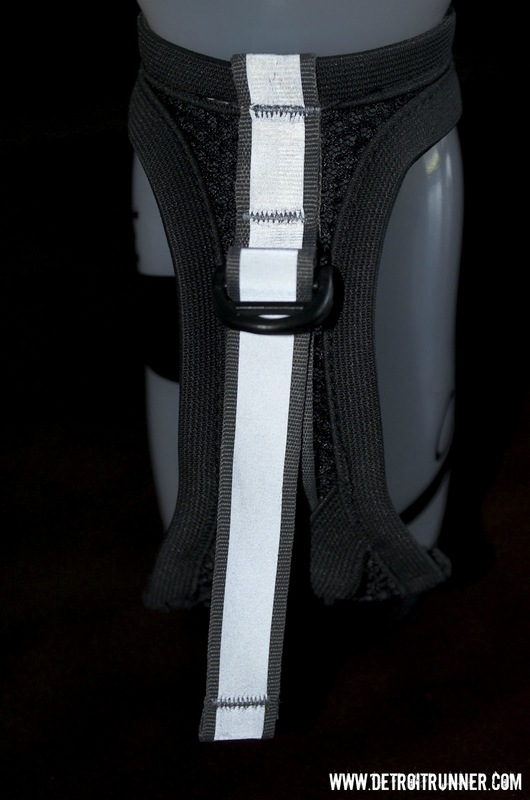 Any additional reflective straps I can get to help cars see me, the better. 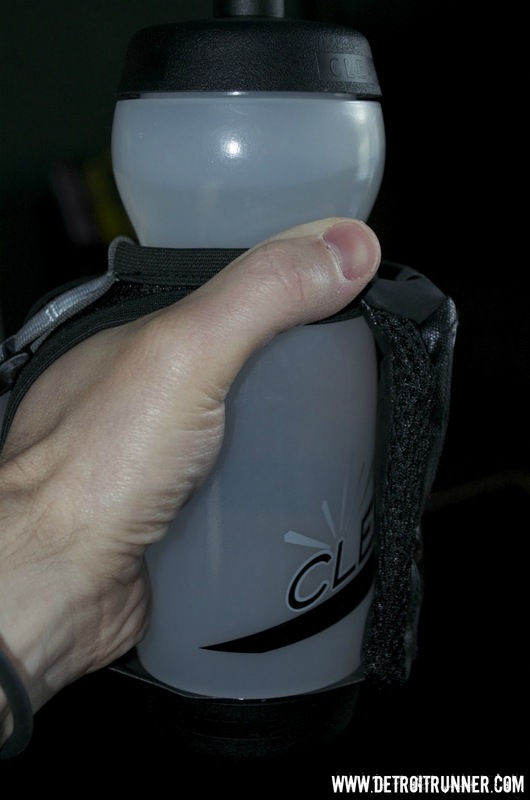 A really unique feature, or at least one I have not seen on a running water bottle before, is the ability to hold gel. 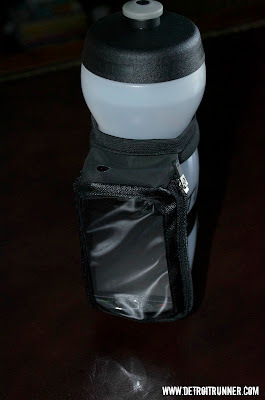 In this case, what is unigue is that it can be held on the strap above where your hand goes so you don't have to use the space where your phone goes to store gel. Personally I thought that was a great design. On the exterior, behind where your phone goes, is another little pocket to store things. In this case, you can see I've got my ipod in there and it fits perfectly. I also happen to like it there so that it really does not get wet/sweaty. I'm not really a big fan of carrying my phone with me when I run so I also tried out the bottle by putting in my car keys, complete with the remote control, credit cards, money - you name it and it almost fits here. You could also put in more gel if you wanted. In regards to comfort, I took two pictures of the handle to show you how it goes around your hand. It's quite comfortable and I had no problems carrying it. 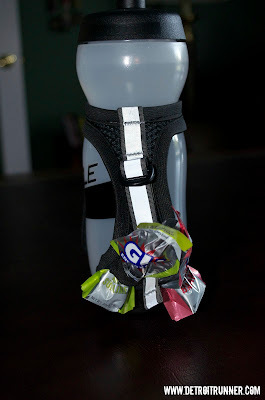 The longest run I've used it on so far is a half marathon race and I didn't even notice I was carrying it --- until I needed water and there was no water station around! Overall, the product is made really well and was a well thought out design for runners. 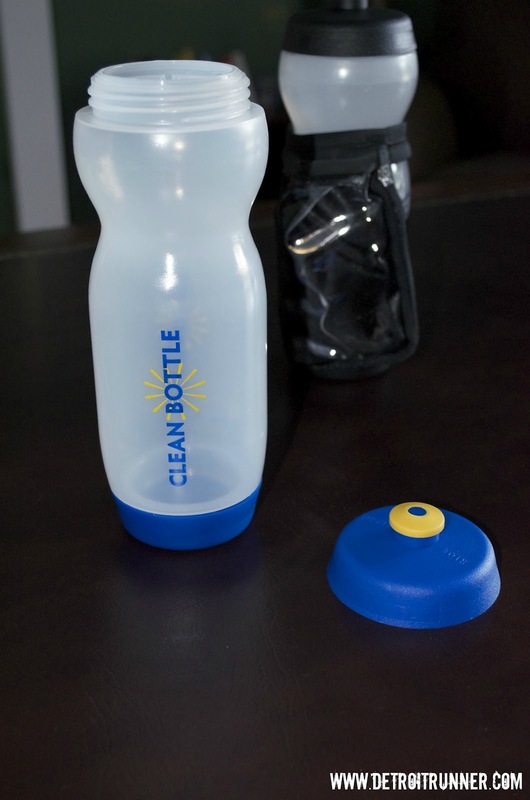 If you are considering getting a new water bottle, I suggest you put this one on your list. It's now become my "go to" bottle of choice for all my daily training runs and races. They have a deal on their website right now where you can get two bottle as I've reviewed here for a special price of $29.80. You will be happy you tried it. 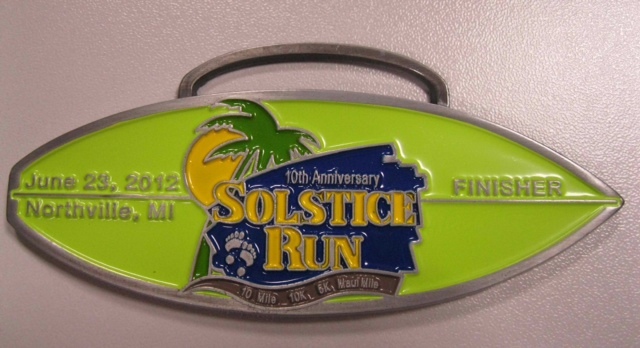 Reminder: Solstice Run in one month - sign up now!!! Hey, everyone! As you know, I'm the resident blogger for Kona Running Company's races and this is a reminder that the Solstice Run will be coming up exactly one month from today. It's an extra special day because not only will this be the 10th anniversary of the race, it also happens to be my birthday. Just what I asked for - a great birthday run! So I want all of you to celebrate with me by joining me for a race at the Solstice Run. And even if you are not ready for the longer runs or you're looking to work on your speed work or would just like to walk, you can also sign up for the 5k run/walk or the Maui Mile. 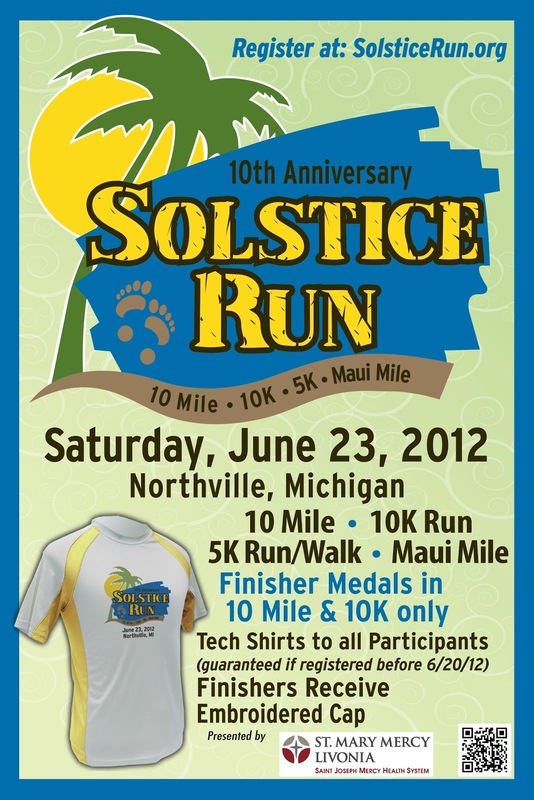 The 10 mile, 10k and 5k include a Kona Running Company 10 year anniversary cap and an awesome tech shirt to go with it. The Maui Mile will include the tech shirt. You must sign up by June 20th to guarantee you a shirt so why not just sign up today? All the races start at Northville Downs. This is an incredible place to start. It's so unique and fun to run/walk around the race track. I also love that there is lots of parking so you are not worried about where to park. Even when the parking lot fills, this year the race is offering a shuttle from Northville High School. 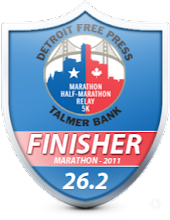 The course is a beautifully designed course and even has a run through downtown Northville before finishing up in Ford field on the track. A great place to finish and still very close to the start where you parked. As you can see it's a bit hilly --- they call it North Hill; not Northville!!! Ha! Actually the hills are not really bad and very reasonable for anyone that trained to run the distance. Ok, maybe better to do a little hill training. Yes, it might be a bit more of a challenge but you didn't want it to be easy to earn that medal, did you? Worried about the heat? Not to worry. The start of the 10k is 7:15am and the 10 mile starts at 7:30am. The Maui mile starts a little later at 8:15am with the 5k following up at 8:45am(with a 2 wave start). Even if you run a 12 minute pace for the 10 mile, that's a finish time at 9:30am so it's still reasonable cool at that time. The 10 mile, 10k and 5k are certified courses so you can be sure the distance will be "at least" what you have signed up for. Last year my Garmin came in at 10.13 miles so very close and remember, you have to run all the tangents to get it perfect. In following with the Tropical theme, next year the race will change it's name to the "KONA RUN". It fits in great with the theme, don't you think? I mean, how many races do you have a Luau party at the end of the race with Hawaiian dancers. This is great fun. Also, one of the best things about this race is they have an expo right after the race at the finish line. 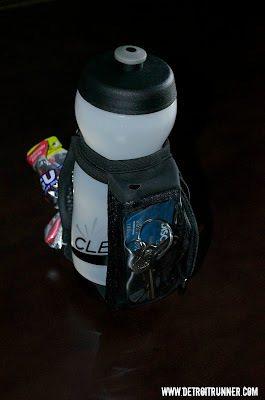 I think it's a great idea and gets all the runners involved with the sponsors and they always have some great freebies. I don't think I know a runner that doesn't like freebies. 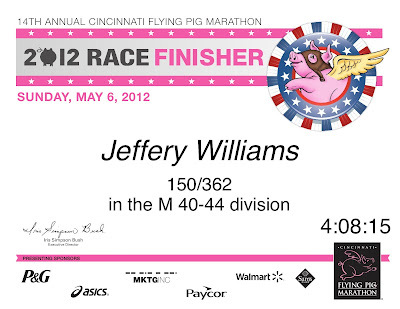 These races are the most organized races I have been involved with since I started running. They always have more than enough information on their website. They have knowledgable volunteers and are always enthusiastic when you run through the Fluid/GU brew stations. They give you updates on their races on Facebook. The courses are always well planned, marked well and have volunteers directing you. They have great entertainment before/after the races. They always have plenty of finish line food with lots of choices. Most of all, they include all the bling - Tech Shirt, Hats, and an incredible medal this year(and previous years). Have you run the Kona races before(Sham Rock N Roll, Solstice or Wicked Halloween)? So who's going to join me and over 3,000 of my closest friends? Sign up now to get a reduced rate. Very reasonable for everything that's included in the race. 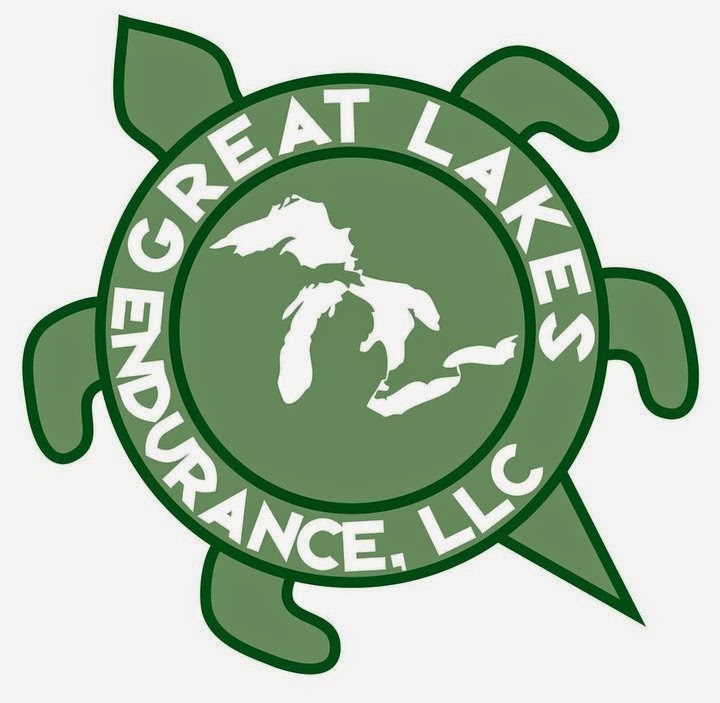 If you are not interested in running, the company is also looking for volunteers and you get a race tech shirt for helping out and can celebrate at the finish line with everyone. If interested, please e-mail Jill: alan@konarunningcompany.com and let her know you are interested in helping out. It takes hundreds of volunteers to put these races together and any help is very much appreciated. I look forward to seeing you out there! 5 miles on the schedule today. I decided to take an extra rest day today. I've had the Scarpa Spark Trail Running shoes for the last couple of months now. As you know, I've been getting into trail running. Not only is it better on your legs and knees, it's also more scenic and there are no worries about getting hit by a car. Before I even discuss the shoes, as many of you know, I love when companies consider the environment. These shoes have 29% recycled polyester mesh, 40% recycled synthetic leather, 50% polyester recycled lining, lace and webbing is 100% Ecosensor recycled polyester, the midsole has EcoPure EVA additive to promote degradation in landfill conditions and 25% recycled runner outsole - how's that for protecting the environment! Of course, I'd expect nothing less from an outdoor company like Scarpa. I've really tried to put the shoes through the paces even though I'm relatively new to trail running. I've run with them on all surfaces including cement, asphalt, dirt roads, sand, grass, smooth trails, technical trails, and muddy trails. I've also run all the elevations so I've put them through lots of hills. The only thing I really did not put them through is stream crossings and frankly, I'm not sure I would do that often anyway unless it came up in a race. My first impression when I received them? Wow! What a great looking shoe! I mean, if you are going to run on trails, why not look good while you're at it. Ok, ok, I know that's should not be a high consideration on the list of why you buy trail running shoes but it is a bonus. The first time I tried on these shoes, I could not believe the instant fit. They are incredibly comfortable. For the record, the sizes are European sizes. I wear an 8.5 shoes size and these were a 41 1/2 - they fit true to size. In addition, they are light at about 9.5 oz. While I have run in many different brands of shoes, most shoes usually take some time to get used to before you are comfortable doing any kind of higher mileage on them. In fact, I don't think I've ever run in a pair of new shoes for least several times of three mile runs or less before I start upping the mileage. I felt so comfortable in these that my first couple runs in these were six miles. With the Spark, I had an instant connection to the shoe which is very rare for me. The comfort was awesome! The shoe has a wide toe box which I think really helps with the comfort. I didn't feel like I was trying to push my feet into them. The upper felt very comfortable and wrapped nicely around your foot without a tight feeling to it. I also like the laces on the shoes. The laces have a type of pattern in them to help them grip better. Even though I alway double tie my shoes when running, the grip on the laces felt strong. One thing I did notice was they do take a little extra work to tighten up the shoes. The lacing system is a little different from other shoes in that they have a couple different lace holes from traditional lacing holes. Personally, it did not bother me but I could see some of you not liking this. The other concern was on that lacing system. Was it going to be strong enough to endure all the running you would do on the trails? The shoe performed exceptionally well and has withstood all the running I've put them through without any issue. I would say that these are trail shoes, they are made for the trails and should be used for trails. I used them on concrete and asphalt to see how they would perform. They seemed to perform well but there is less cushion on the shoes and I would not be comfortable running any distance on them on hard surfaces. 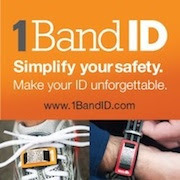 This shouldn't be an issue for you because you should be buying these to run trails. The drop on this is also closer to a minimalist shoe with a midsole 6mm drop. I personally don't consider the shoe minimalist unless the drop is 4mm or less and perhaps why I could transition to these so well so quickly. I typically run in shoes with a 12mm drop for the roads but it does seem like every manufacturer is moving towards a lower drop. I've also run in zero drop trail shoes as well. Those take getting used to and cannot be transitioned so quickly like these shoes. As I discussed, these were no issue getting used to. I was able to transition from my regular road shoes to the Scarpa Spark with little difference in running mileage. My calves could feel the extra work but not so much that you could not get out there and do your run right away with them on longer mileage. In regards to trails and dirt roads, they performed really well. I ran with them at my last half marathon which was mostly trails and the large knobs on the sole dug into the ground well and kept me stable going up hills. In parts of the trail, where there were medium sized rocks, you could feel the rock - perhaps a little more than I would like but the cushion overall worked very well for all trail conditions. I was able to put them through a trail half marathon this past weekend(along with countless training runs) and they performed really well. The race gave me the best test of the shoes to get a feel for whether I would continue to race in them going forward. The answer is absolutely I would! They were comfortable, kept my feel in place, kept my feel cool, had a great grip when needed and even performed well on the short paved areas that I ran. If you are thinking of getting into trail running and/or are already running trails, check out the Scarpa Spark. 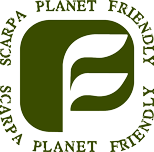 Thanks to Scarpa, I'll be out on the trails much more this year. * Note: I received a complimentary pair of Scarpa Spark for purposes of this review. All opinions in this review are my own and I was not required to give a particular opinion.